After all the study and hustle, you're finally working for a prestigious designer you've always admired. To everyone else, you're living the dream and they'd be right to assume that, you love your job, so why are you still frustrated? This is the position Rae Liu found herself in when she was working as the accessories development manager at Alexander Wang. Yes, we can almost hear your ears prick up at reading that name and while Liu tells me those three years were some of her best (and she learned so much), she felt the itch to break out and do her own thing. And for the past seven years, Liu has been doing just that as the co-founder and creative director of the extremely successful accessories brand, Leatherology—I never travel without their double zip bag. 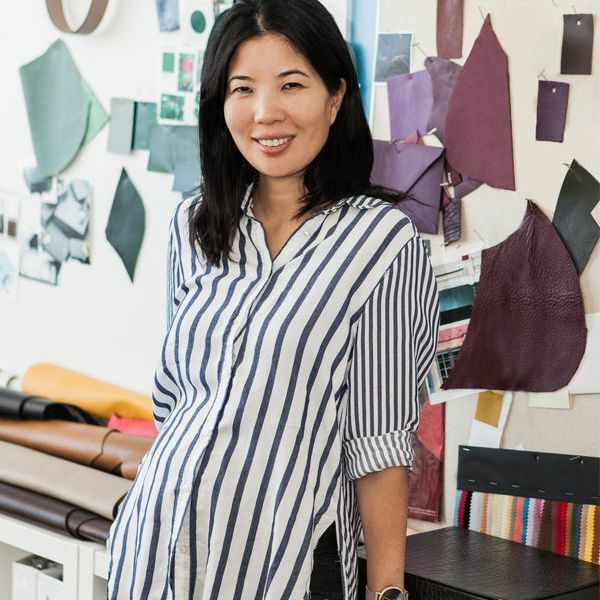 Ahead, Liu shares her unfiltered journey from working at the World Bank to Alexander Wang and how she made the leap to start her own business. Spoiler alert: It was hard, very hard. Talk us through your first career path? I studied political science at Columbia, and when I graduated, I walked out the doors knowing I wanted a career in public service. After graduation, I was fortunate to work at a housing non-profit and then for a few years at the World Bank. I loved the mission of these organizations, but I did not love the work and struggled with the day-to-day pace. I wanted to have a faster impact and I realized that’s not really possible when you are talking about housing development or a billion-dollar infrastructure project in another country. I thrive on a little bit of pressure and the ability to quickly and directly affect change. I craved more creativity and I wanted to find a job that I would be excited to wake up to each morning. I quickly realized that something needed to change. How did you make the transition from non-profit to becoming an entrepreneur and launching your own business? Well, it didn’t happen overnight, but rather it was a multi-step process. My initial career plan didn’t work out so I started over at 25, which doesn’t seem like a crazy idea, but it felt that way at the time. I knew I was interested in a few different industries and spent a year trying out different jobs in digital marketing, fashion, retail, and food. Talking about it now makes me sound like a free spirit, but for someone who’d had such a deliberately planned academic and career path, the experience was humbling and disorienting. After some trial-and-error, I found I loved accessories, and one of the things I did that year was to enroll myself at FIT (Fashion Institute of Technology). I began interning for different designers, and I was eventually hired by an accessories company called Be & D. They let me do a little bit of everything—art direction, web design and UI/UX, development, production, sales, sourcing, etc.—and I loved the variety of it. From there I was recruited to join Alexander Wang, where I helped launch their handbag, and later, footwear business. Both of these jobs were super entrepreneurial and gave me a strong foundation in leather goods—the companies I was at were in early growth/start-up stage, and there was a lot of room for someone motivated to make a big difference without a lot of supervision. You could say I caught the start-up bug at this point, so when I decided to move back to Dallas, I knew I wanted to create something of my own. Tell us about your current career path/business? What's involved in starting a business? Was it easier/harder than you thought/and why? Leatherology is a direct-to-consumer leather goods brand that is redefining simple, everyday luxury. We make beautifully crafted leather essentials that are meant to be timeless, colorful, and easy to personalize. Our website allows you to preview and order any of our items with debossed or hand-painted initials. Our branding is very subtle by intention because we want you to make each item your own. Coming from a fashion background where there is a relentless push toward “newness” and designs rarely had an opportunity to be tested and perfected, I felt passionate about creating high-quality leather accessories that were accessibly priced, seasonless, and thoughtfully designed down to the last detail. I hated the fact that as a young woman in New York, I could not afford the very products I spent my days creating, and that the ones I could afford did not have the level of craftsmanship or use the quality of materials I knew was possible. Entrepreneurship has been incredibly rewarding—but is very, very hard. I used to think the hard part was finding the right niche to stake out. That is a hard problem but equally challenging is learning how to build, fund and operate a company. No matter what crazy situations emerge you never get to say, “it’s not my problem”. I’ve also gained a whole new appreciation for the importance of recruiting, retaining, and managing great talent and building a team who can scale our operations up. I am a perfectionist by nature, and I’ve always struggled with knowing when to ask for help and when to let go. I drive myself pretty hard and I’ve burned out in past jobs because I let work become all-consuming. I try to remind myself now that done is better than perfect! I’ve also learned to let go more and give my team the freedom to run. They continually surprise and impress me in return. I had my first child in 2016 and second last year. I’ve been thinking a lot about how hard it is to try to do it all and honestly, I’m still struggling to find the right balance between running the company, taking care of my family, and taking care of myself. Turning 30! I knew early on that I didn’t want a traditional job, and that if I was going to finally make a change I needed to stop talking about it and just do it. I was having a good run at Alexander Wang and had an incredible experience, but it was important for me to move closer to my family. The hours in fashion can also be punishing—late nights and all-nighters for weeks leading up to a runway show. At some point, the novelty wore off and I just thought there had to be a better option. I get to be both creative and analytical on a daily basis. I love product development, and I get energized by building and creating beautiful things and turning ideas into reality. I am also a math nerd, and running a company requires me to flex analytical muscles regularly. And honestly, after spending 10+ years in start-up environments, I can’t imagine going back to the bureaucracy of a big organization. Know that the timing is never going to be perfect and that you will never be fully prepared. Have mentors or a support network and friends you trust to give you honest career advice. Running a company can be very lonely, and it helps to surround yourself with people you have strong relationships with who will support you, provide a long-term perspective, and keep you grounded. Every time I’ve wanted to make a change in my career, it’s because I was fundamentally unhappy about something. So instead of looking at change as something to be feared, I try to look at it as an opportunity to make things even better. I’ve waited too long to make some decisions. My nature is to analyze even when my gut instinct tells me something different, and that can lead to a long decision-making process. Sometimes that delay has financial implications but more often it’s an emotional drain I wish I’d avoided. I listen to my instincts more now, even if that means failing and course correcting later. I love my team. We’ve grown it slowly and carefully over the years and I am humbled by their passion and talent as we build something meaningful together. I also love that I get to be creative and see those creative ideas turned into real products and designs. For a product geek like myself, there is nothing more thrilling than seeing an entire production floor making the thing I conceptualized, and then opening Instagram and seeing that product being loved by someone out in the wild or getting positive customer feedback. I’ve learned something important in every single job I have ever had, even temporary ones. So, while it’s tempting to say I should have taken a straight line to where I am today, the zigs and zags were important in making me who I am. The advice I’d give the younger me is to believe that I deserved great opportunities. I was too reactive. I took jobs that came to me instead of going out and trying to find the perfect one. Or proactively telling my supervisors what I was passionate about and asking them to help evolve my role to give me a shot at that thing. Entrepreneurship is wonderful, but it is hard, and it is not for everyone. Anyone who paints it otherwise isn’t being honest. If you are fortunate enough to have amazing opportunities within the company you are at and you are happy, then appreciate that. I created an opportunity for myself because I wasn’t happy and I didn’t have those opportunities, but it would have been way easier and potentially just as fulfilling to do this within an existing organization. One—go for it. The timing will never be right. If you wait until you have the perfect opportunity or “enough” experience, you’ll never make the move. There are always rational reasons to wait, so you have to some amount of irrational optimism to take a chance and make something great happen. And guess what—failing probably isn’t as painful as you imagine. Conversely, be prepared for some lonely days. Don’t give up. There will be great days and there will be very hard days. One—go for it. The timing will never be right. If you wait until you have the perfect opportunity or “enough” experience, you’ll never make the move. There are always rational reasons to wait, so you have to some amount of irrational optimism to take a chance and make something great happen. And guess what—failing probably isn’t as painful as you imagine. Conversely, be prepared for some lonely days. Don’t give up. There will be great days and there will be very hard days. Two—as you start to grow and scale up it becomes critical to find the right people. Be honest with yourself about what really motivates you, and what you are good at vs. what you are not. You may be the world’s best designer, but you’re not going to be able to run a business successfully if you don’t have someone who is great analytically and operationally to help you out or vice versa. Scaling up gets complicated fast. You need to think about how your IT systems can evolve, how to anticipate and head off operational breakdowns, and how to manage the HR concerns of a growing business. It’s important to know where to get help fast. Finding good people will not only help you plug the gaps, but it will help you free up your time to focus on the aspects of the business that really motivates you, and massively improve your quality of life. Three—learn Excel! That is seriously the tip I would give. Even in a creative field, in the early days, you’ll probably be running most of the business yourself and you’ll want to have an understanding of numbers and data so you feel empowered about your business. Up Next: How One Woman Turned Her Ceramics Hobby Into a Thriving International Success.